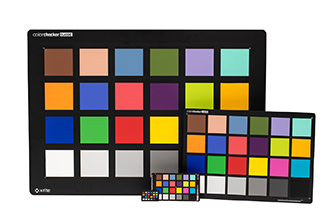 The ColorChecker Classic target is an array of 24 scientifically prepared natural, chromatic, primary and grayscale colored squares in a wide range of colors. Many of the squares represent natural objects, such as human skin, foliage and blue sky. Since they exemplify the color of their counterparts and reflect light the same way in all parts of the visible spectrum, the squares will match the colors of representative samples of natural objects under any illumination, and with any color reproduction process. Each solid patch is formulated individually to produce a pure, flat, rich color. ColorChecker Classic is an array of 24 natural object, chromatic, primary and gray scale colors, arranged in four rows. Taking advantage of the Classic target is easy. 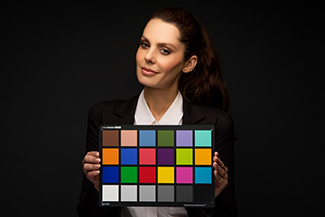 Simply include ColorChecker Classic in your photo or video capture and then later, while editing, use it to compare, measure and analyze differences in color reproduction in any color rendition system. The Classic can help you make global corrections based on accurate information. If you shoot a large number of images that all require the same color correction, you know that editing a few key photos and applying your changes can sometimes change colors you didn’t intend to be changed. A shot of the ColorChecker Classic captured under the same lighting as your images will provide a point of reference, so you can see exactly how changes will affect the rest of your colors before you apply them. This objective standard will help you avoid costly mistakes and trial-and-error color adjustments while editing your images or color grading. ColorChecker Passport Camera Calibration Software supports the Classic target. It includes both a desktop application and an Adobe® Lightroom® Plug-In for creating custom DNG profiles. If you’d like to take your digital photography to the next level and create custom profiles for your digital camera, download here. +How to apply new ColorChecker reference data in third-party applications? +How to create custom reference data for ColorChecker Charts using i1Profiler? +Why should I use a DNG Profile? +Where are my DNG profiles located? 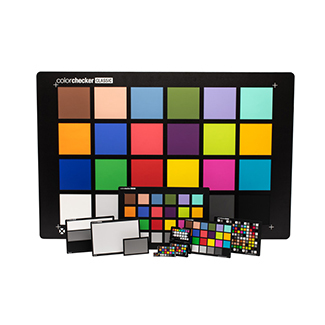 The ColorChecker® White Balance target is spectrally neutral to deliver accurate white reproduction for both photo and video workflows. Use it to perform custom in-camera white balance to guarantee precise, uniform, neutral white - under any lighting condition.